Many parents worry that by carrying their baby in a sling, that they are going to create a “clingy child” who won’t be put down. There is a lot of pressure from society to “put your baby down”, a fear that responding to the cries of a child will somehow spoil them. Many people believe that children need to be trained into early “independence” and that too much love holds a child back. This is very, very incorrect. It is disconcerting for a babywearing mother who has carried her child frequently from birth to find that he wants to be held much more than his contemporaries, and when the time comes (if it does) for childcare from other individuals, her baby may protest very vigorously and will not allow another adult to look after him. 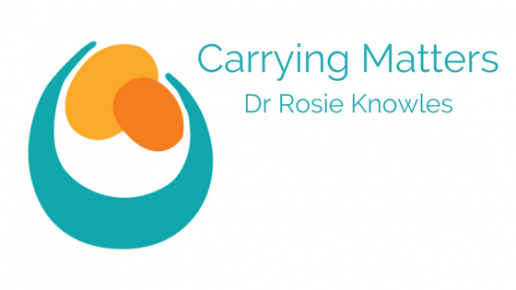 All too often, at this point, the words “rod for your own back” surface and the use of the sling is blamed for the child’s behaviour, labelled as “clinginess”. People can use this as a reason to reinforce fears that a child has been “ruined” by the cuddles. For a new parent, doubt can creep in; a fear that somehow, somewhere, a wrong choice has been made and a child’s independence has been stunted by keeping them too close. Watching parents and children struggle to separate can have an influence on bystanders; encouraging them to think that sling use is more trouble than it is worth. They are wrong. It would be worth at this point, to briefly recap the value of close bonding and secure attachment. Close contact that began at birth and has continued uninterrupted will have initiated, facilitated and consolidated a positive bonding process (mediated by oxytocin). Such children are likely to have secure, positive attachments to their primary caregivers, which is essential to their physical and psychological health. This is how to build a happy brain; responsive parenting. Children who know their own value and have a rock-solid foundational experience of having their basic needs met, will have trust and confidence in the loving adult relationships around them. This builds resilience, a vital tool to help children thrive despite adversity. When it is biologically appropriate, they will be more able to turn to independent play as they know and trust their mother is there, even if out of sight; she will not abandon them, she has consistently always come back. As they grow older (towards their first birthday), and begin to develop more co-ordination and independence in movement under their own steam, they will have the underlying security to roam further and further freely. This takes time to develop, and individual personalities play an important part in this. With this natural, biological change and development in their bodies, they will also demand less frequent contact, less frequent feeding, and begin to expand their horizons. This is often the point at which carried babies begin to want to be carried less; to reach for the floor where they can explore, and investigate the world around them. They may even begin to refuse the sling from time to time, often to the carrying parent’s chagrin! Modern society expects children to become independent individuals extremely young, praising and rewarding those first shuffles forwards, first crawls and first steps, and being quick to criticise or discourage behaviour that demonstrates need. However, it is normal for babies to express their needs, such biologically appropriate behaviour should not be “trained out of them”. If a child has been carried in arms or a sling from birth and has strong, secure bonds with his caregivers, it is entirely normal for him to expect support from these caregivers in the way he has always experienced it, whenever he asks for it. The neural connections in his growing brain have been solidly reinforced over and over again. It is also normal for him to protest when he is removed from his trusted habitat and asked to accept different caregivers he may not know. This child is not “clingy” in the sense our society means it; it simply means he is habituated to the close contact he has enjoyed all his life, just as his ancestors were; and such close contact is normal for human babies. With the natural progression of his emotional and psychological development, as well as the growth of his physical skills and strength, his needs will change. Until that stage is reached, a child will expect continuity of care and for things to remain unchanged. 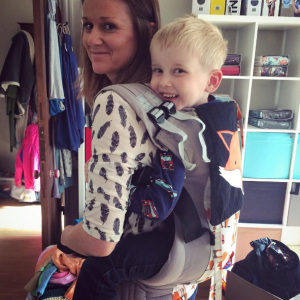 The eight month to twelve month period is often when children experience separation anxiety and often coincides with things like parental return to work, introduction of new spaces and places, and of course the sling will play a part in providing reassurance, until a child is ready to move on. It is a safe space, rather than being the root of any “clinginess”. In our society, babies are carried much less and put down a lot more than they used to be. Some fairly recent British data in 2000 (Baildam et al 2000) suggests that mothers spent an average of just 61 minutes in 24 hours simply holding their sleeping or crying six week old child. This figure was only 17 minutes when the child reached one year old. When feeding contact was added to the data, 6 week old infants spent an average of 3hrs 27minutes out of 24hrs in contact with their mothers, and 2hrs 23minutes at one year old. Given the trends in current mainstream society, this is likely to have declined further. For many babies, their parent’s body has never been their primary habitat, their early communication attempts were never met positively, and for some, their bonding may be less secure and demonstrate more insecure or ambivalent patterns. Earlier “separation” may have been gained, but at some cost to future mental health. Don’t be afraid to hold your unhappy baby or to use a sling if they want to be close to you (it means you can be hands-free while you meet their needs). It is always worth building secure attachment relationships. Your baby’s babyhood does not last; soon they will no longer need you in the same way, build that solid foundation while you can! So, when does normal, biological independence for the human child develop fully when allowed to proceed at its own pace? Well, personality plays a part in this; a single family may have very different children who have been parented the same way and yet have different needs and develop confident independence at different times. Generally, however, anthropological studies would suggest that full independence would occur when a child has completely self-weaned from breastfeeding and bed-sharing, no longer requests frequent in-arms carrying, being able to reliably move from place to place unaided, and able to verbally communicate effectively; usually around age three for carrying (even only occasionally, in piggy back form). Breastfeeding and bed-sharing often continues much longer in more traditional societies. This is much, much later than the socioeconomic model many of us live in. Children are incredibly adaptive, and as there is so much technology available and so much societal pressure to encourage this early separation, this often means that babies can and do learn to need their parent less than they normally would at their current age. 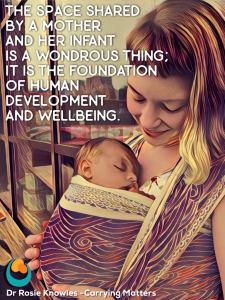 They can learn to not to raise their arms or cry for contact, they can learn to stop asking for breastmilk, and they can learn to sleep alone, however they may be missing out on much of the opportunity for emotional and psychological growth in these crucial formative years. This is the current societal norm; to put babies down rather than hold them close. So it is no surprise when a parent chooses a more instinctive and natural means of rearing their child, that clashes develop with other parents and older generations who have simply done what the culture around them does and did before them. Why change things? Grandparents may feel rejected if they feel their own child has chosen to parent differently from them; gentle discussion about current research and new understanding of child development and tactful understanding can go a long way in resolving such conflicts. Many families will feel they have little chance to spend as much time with their children as they would wish due to work pressures; regret or resentment about this may manifest itself as criticism of others who are able to care for their children in a different way. They may not know there are comfy slings for older children; would it be worth visiting the local sling library? 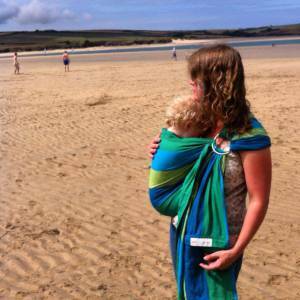 People often worry that their babies will only ever sleep in a sling or resting on them. This is the natural, normal place for a child to sleep, in the haven of his parent’s secure provision. 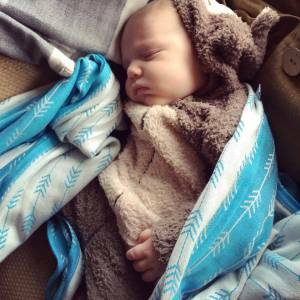 A baby falls asleep when he feels warm, safe and loved; it is no surprise that babies love to sleep in their parents’ arms; and as we have discussed, as they grow, their need for this will gradually decline. If you have the kind of life that cannot allow a child’s sleep physiology (or accepting non-parental child-care etc) to mature at its natural pace, then it would be wise to ensure that your baby is well used to happily and easily and trustingly settling to sleep in different locations; or well used to care from other trusted adults and this will be easier if he has the underlying attachment foundations and parents who respond to his need as it arises; he will trust them that the places they lay him to sleep are secure, once he is a little older with the psychological maturity to accept this. In summary; slings will not make clingy children; your child is demonstrating normal human infant behaviour, and has had a very positive start to life with a securely attached foundation to build on. All children eventually learn to feed themselves, settle themselves to sleep, walk unaided and accept care from other adults; some learn it sooner than others, but they do all learn it, and as parents, it is our responsibility to choose a method of childrearing that feels right to us and is going to give our children the best start in life possible in the circumstances we live in. Baildam, E. M., Hillier, V. F., Menon, S., Bannister, R. P., Bamford, F. N., Moore, W. M. O., and Ward, B. S. (2000). Attention to infants in the first year. Child: Care, Health and Development, 26:199–216.